Despite all of the panic and online hysteria, the newly-constructed Holly Pointe Commons has been a relative success. The expectations for the new complex seemed to have been placed pretty low, with online commenters on news stories fuming over the possibility of assaults in all-gender bathrooms, or potential eye sores caused by the admittedly ugly outer design. But as far as the Whit’s reporting has uncovered, there have been no major issues with the Holly Pointe bathrooms. The Whit even commended the design in an earlier editorial, calling them the best possible option for a university looking to be at the forefront of diversity and acceptance. The new cafeteria, which some may have worried would be the same as the cafeteria in the student center, has been a pleasant addition to on-campus food options. Seldom has the cafeteria been overcrowded with residents of the new building, it has served different meals than in the student center and offers a new view of campus while you enjoy a meal. The Whit reviewed the new cafeteria in September and gave it a B+. The coed design of Holly Pointe’s living space (named pods) hasn’t seemed to create any criminal activity – or at least the Whit has not been made aware of any. Residents seem to have avoided the problems associated with of rooming with a partner or significant other, and those who chose to have avoided agitating neighbors thus far. All of this accompanies the overlooked fact that Holly Pointe managed to open on time, and with nothing keeping its residents from moving in when they arrived on campus. 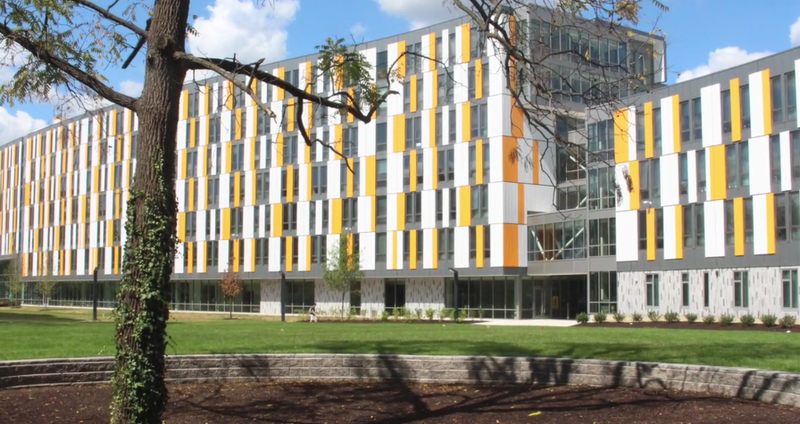 A lot of people had their doubts about the new residence hall and what it represents. Housing on this campus has never been so open or so inclusive. But so far, Holly Pointe, and the staff that operates it, have proven the naysayers wrong. The building also had to ward off some vandals attacking part of the halls. One incident cited by an email to students apparently included one offender ripping bathroom signs off of the walls, while another individual defaced or destroyed the political posters of the candidate one resident chose to support in the upcoming election. But these are problems faced all over campus, and on campuses across the country. For the most part, Holly Pointe has avoided the potential problems associated with its unique features. Things can certainly change, but so far Holly Pointe has been a success. For questions/comments about this piece email editor@thewhitonline.com or tweet us @TheWhitOnline.